If Chris Christie did this, there would be another federal investigation. 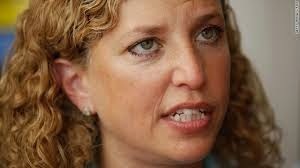 South Florida Rep. Debbie Wasserman Schultz’s office is claiming her appearance at the Grammy awards Sunday wasn’t a just a junket for a star-struck politician dying to rub elbows with the glitterati. It was a research trip, paid for by the congresswoman’s campaign funds. Remember that NAACP bombing in Colorado? Good news! Eggs are back on the breakfast menu. Walmart policy is to let shoplifters go?